Chinese character and stroke order animation"How do I write 立 ( lì ) correctly?" 立 can also be used as a radical, i.e. as a sub-component of a Chinese character. It is then called lìzìpáng. 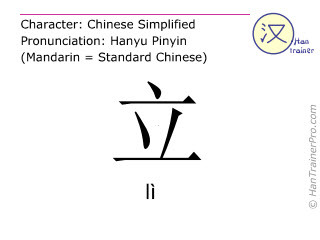 立 is composed of 5 strokes and therefore is of very low complexity compared to the other simplified Chinese characters (average: 13.1 strokes).